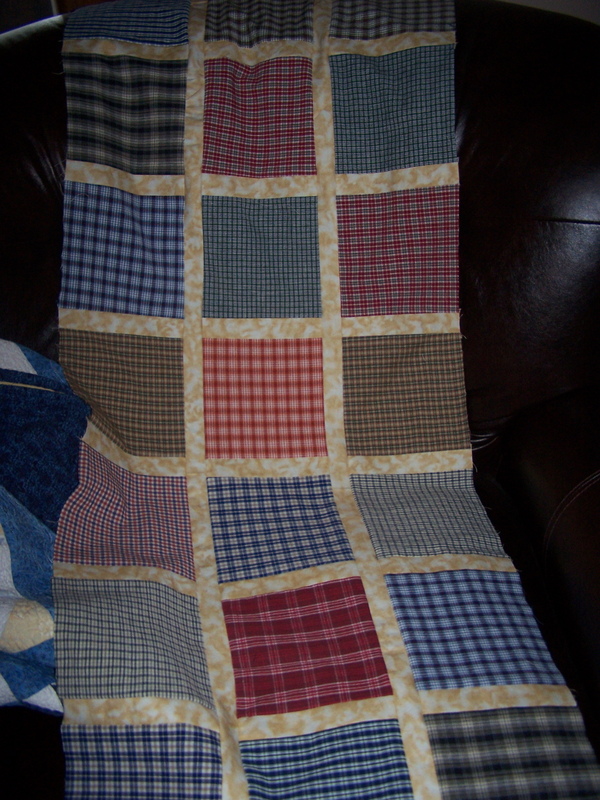 Suzanne has a post on her blog today about simple quilting. Sometimes a simple piecing pattern is the right choice. Here is my start on the first of two memory quilts commissioned by a family. The squares are cut from shirts that belonged to to their 14 year old brother, who was tragically lost in an auto accident 7 years ago. The quilts will be a gift to their mother. What an honor to be trusted with such a special project. This is what I’ve been working on this week, along with trying to finish up a custom quilting job that has been on my machine waaaayyyyy too long. what a wonderful gift and a great responsibility. i love the simplicity of it. What a heartbreaking, yet touching gift to have a part in. How awesome to be able to share in such an awesome gift. The simplicity speaks volumes. Great job! I made a memorial quilt once – it’s an incredible responsibility. Your quilt will be a wonderful tribute! What a wonderful gift Randi and so nice that you are the one doing it. Great quilt and a beautiful memory. I love the design chosen and how it showcases the memory – a more complicated quilt might take some of the focus off of that. The mother will be so pleased. What an honor it is to be able to do that for the mother! I am sure she will be very touched. (((( Randi )))) to help you with the memory quilts. God bless you. Randi, I have all of my dad’s flannel shirts but haven’t known how I want to use them in a memory quilt. I like what you’ve done and am eager to see it all completed.